African sensibilities for color selection and skills in textile production carried over during the transatlantic slave trade. Black women, in particular, made various types of pieced textiles, patchwork, and appliqué and embroidered quilts during the antebellum and post-slavery eras. As a result, the legacy of quilts as an expressive outlet for the display of African retentions remains and thrives within some African American communities.13 Most notably, the quilts produced by women from Gee’s Bend, Alabama, have received much attention, with several traveling exhibitions throughout the country over the last twenty years, including the one that Brooker viewed, Gee’s Bend: The Architecture of the Quilt, at the Philadelphia Museum of Art during the fall of 2008.14 Evidence of the collage-like quality of combining overlapping fields of color in distinctive shapes and varying sizes appeared in Brooker’s work long before he had ever laid eyes on the quilts of Gee’s Bend or on quilts such as the pieced and appliqué quilt made by Marie Hensley (1870–1932) from McDowell County, North Carolina (early 20th century; fig. 6). 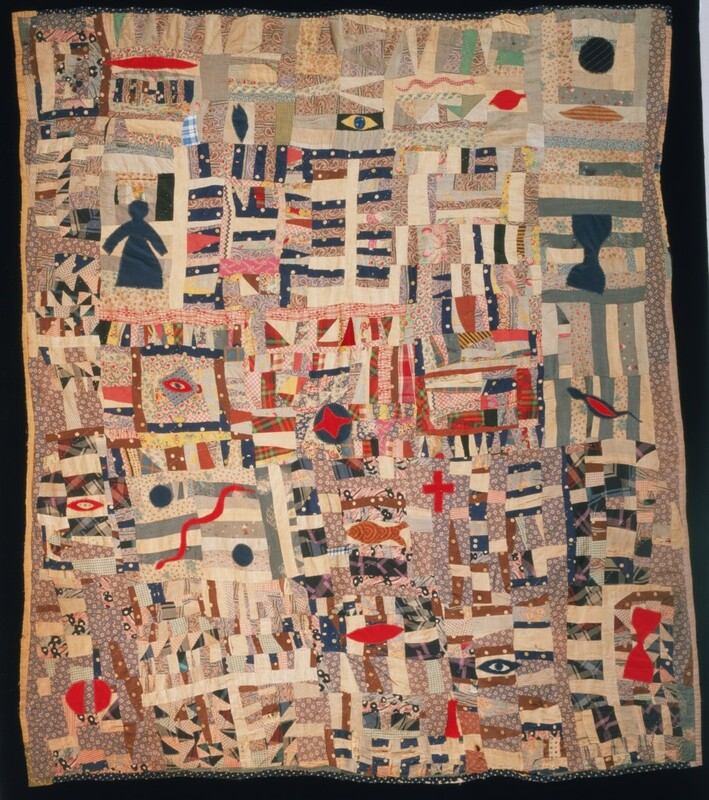 Nevertheless, when questioned about how southern women’s quilt-making practices affected him, he acknowledges that their quilts reflect the same type of intuitive “African choice system of color and shape.”15 In Ancient Futures I, Brooker anchors the background with a patchwork quality of large rectangles of vibrant hues of orange, red, green, blue, and black. Brooker wakes up at five o’clock every morning to paint. He first began this daily schedule shortly after the birth of his first child in 1973. When he had to teach at night, he took care of his son, Musa, during the day. Working primarily during naptime, the artist remembers this as one of the most productive periods of his career, creating 150 works on paper and canvas a year for five years straight. Within his music-filled studios, at home or now in the converted nineteenth-century textile factory in Philadelphia, usually jazz or gospel music plays. He is able to metamorphose what starts off as a series of small drawings on paper into larger paintings on paper and canvas. Although his works may have the appearance of having been done quickly—frenetic long dashes of pastels across blocks and grids of oil or encaustic—they are actually the result of painstaking hours, days, and months of sketching, painting, and, at times, pensive looking. 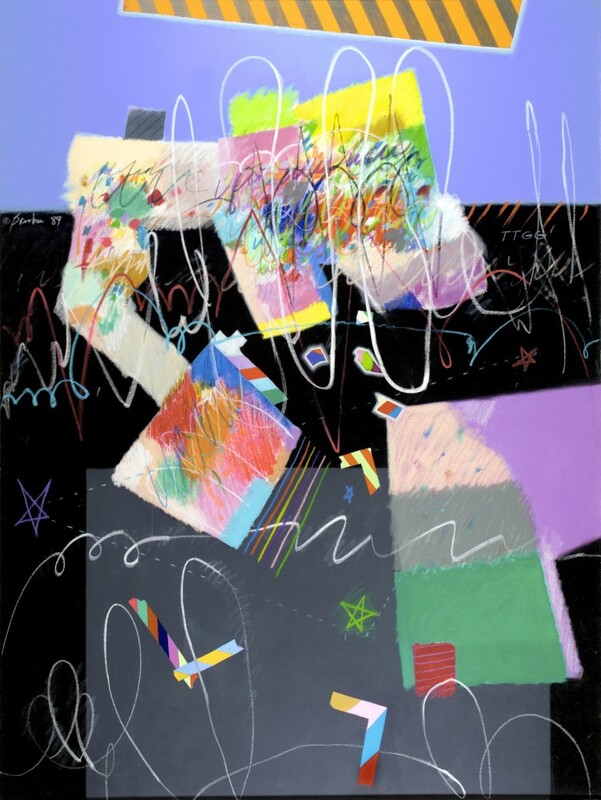 In the context of Brooker’s upbringing in the black communities of South Philadelphia and his church, the artist’s philosophical and practical implementation of gospel and jazz music matches his sensibilities toward the ethereal luminescence of Tanner’s canvases and the formal abstract tenets of Kandinsky. Brooker admits that a formal language has consistently been in place for him. Notably, in most of his paintings, the frenzied, text-like lines overlaid on the blocks, bars, and splotches of color suggest a symbolic idiom through which the artist yearns to communicate with the viewer. He developed much of his vocabulary from those he calls “giants of the visual and performing arts,” namely Giotto, Hans Hofmann, Arshile Gorky, Arthur Beecher Carles, Cy Twombly, Sam Gilliam, Al Loving, Ray Saunders, and musicians Miles Davis, John Coltrane, and Charlie Parker, among others. While Brooker eventually moved away from Tanner’s figurative approach to religious painting, Wassily Kandinsky remains one of the most significant influences on his work and the artist to whom he turns for pictorial cues. 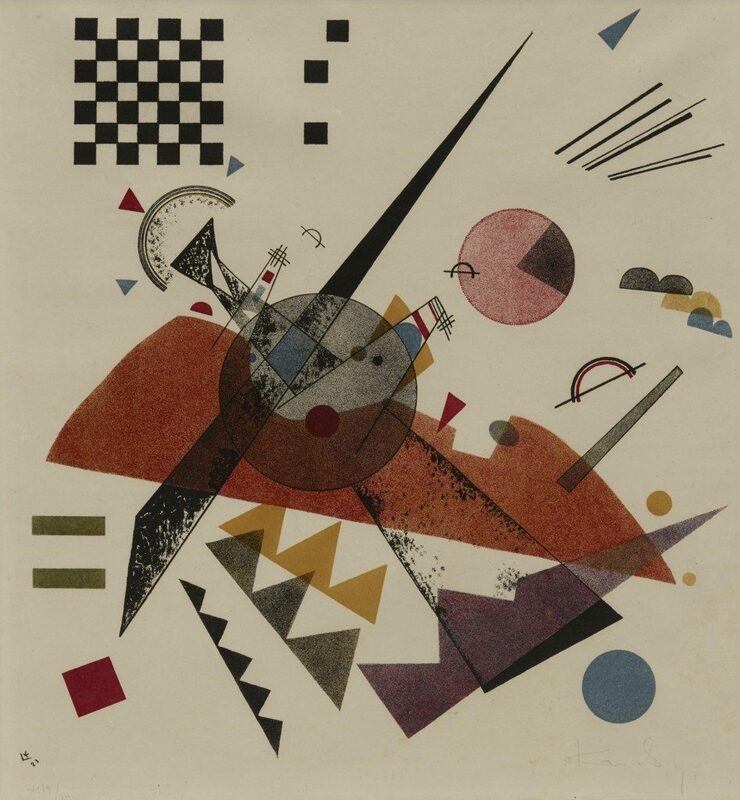 Kandinsky was one of the first artists to abandon recognizable subject matter toward a search for the mystical in art in the early twentieth century. As an artist trained in music, he actively pursued forming an ideology and subsequent language in visual art as a universal form of communication. He, along with Franz Marc, formed Der Blaue Reiter (The Blue Rider) group in Munich in 1911, using a name borrowed from one of Kandinsky’s paintings from 1903. The group modeled their language after the visionary language of the Book of Revelation with the expectation that art should only represent itself—a reference that might resonate with a P.K. While Brooker attended PAFA, his instructor Roswell Weidner encouraged him to read Kandinsky’s Point and Line to Plane, written in 1926.16 The book was “transformative,” Brooker recalled. “Reading it . . . and I still go back to it, for myself and when I teach . . . that’s when I went from being a realistic painter to an abstract painter.”17 While Kandinsky offered some analysis of the psychic qualities of color, as did other artists such as Josef Albers, I am interested here in the musical component that he applies to the visual arts. In his book Concerning the Spiritual in Art, Kandinsky outlined his theories on the aesthetics of shape along with the psychology and language of color and form in painting, which made him one of the first European artists to break through the representational barrier into total abstraction. For Kandinsky, the breakdown of the figure-ground relationship, along with actively experimenting with color and line for its own sake, provided an unmatched, ecstatic spiritual fulfillment. Within his analysis, the “spiritual” is non-material, practically anything that cannot be touched by hand.18 In the section “The Psychological Working of Color,” Kandinsky proclaims, “Generally speaking, color is a power which directly influences the soul. Color is the key-board, the eyes are the hammers, the soul is the piano with many strings. The artist is the hand which plays, touching one key or another, to cause vibrations in the soul.”19 According to Kandinsky, colors have specific emotions and meanings attached to them depending on the hue and their placement next to different colors—the warmth or coolness of red may represent fire or anger or passion. In Brooker’s Kinda, Sorta (2006; fig. 7), blocks of red anchor the painting at the top and bottom of the frame, creating “motion within itself,” according to Kandinsky’s analysis of the “language of form and color.”20 Focusing on the highest part of the composition, the motion of the “hot” red cools and slows down the metaphysical viewing of the color as “flames” in contrast to the accompanying “cooling” effect of the lighter red and blocks of varying degrees of blue on either side, where “the gazer may seek relief” in the latter.21 Brooker’s study of early twentieth-century color theory rhymes well with his commitment to the spiritual resonances of painting by both Tanner and Kandinsky. Brooker served as professor and chair of the basics department at Moore College of Art and Design in Philadelphia before his retirement in 2015. He taught his students that consistent contact with the work allows for a transformation that is different than working on a work of art for extended hours and then taking a break for, say, two weeks. By his own example, he instructed his students to answer questions about their art that only habitual working can resolve. Brooker’s philosophy is: “Questions lead to search. Search leads to discovery. Discovery leads to adventure. For me, that’s the process that lets me grow constantly.” He is interested in the depth of the human spirit and “the unspeakable joy” found therein. 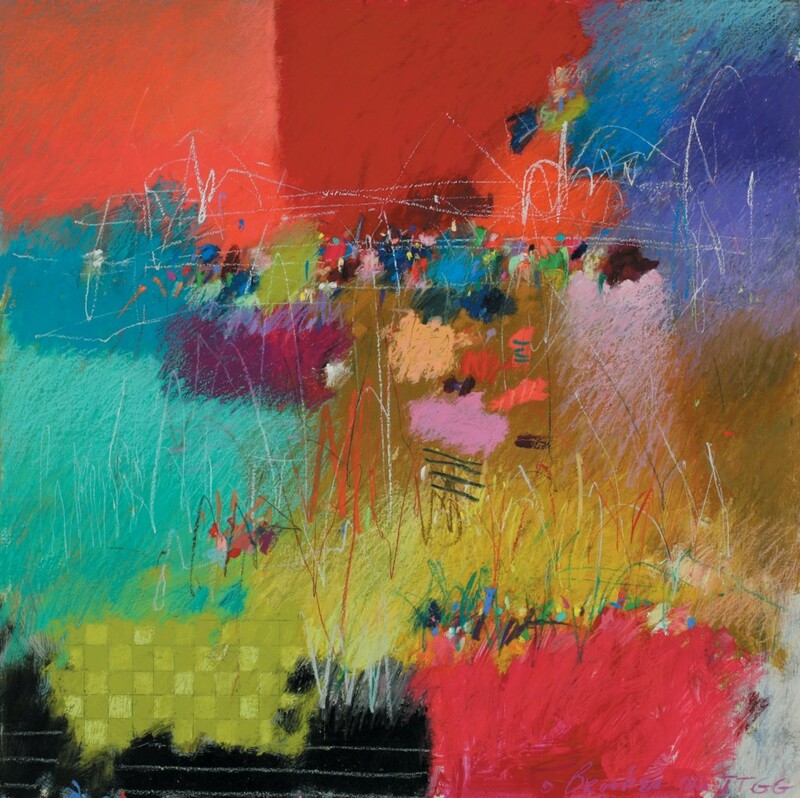 Much like Kandinsky’s own, often moving descriptions of paintings in Concerning the Spiritual in Art, each painting for Brooker is intended to reflect “the love and excitement, the disappointment and sadness and nurturing [since] these are the many layers that exist in the human spirit.” Deeply interested in the materiality of oil, encaustic, collage elements, colored pencils, and pastels as they relate to one another, Brooker’s daily work and continuous layering, both physical and essentially metaphysical, provide many of his paintings with an unfathomable depth and movement between planes of color. Therefore, discoveries are only made because of the systems that become established as a result of daily work, the art-historical study and ritualistic attendance in the studio that, for someone like Brooker who is shaped by Tanner and Kandinsky, transforms into worship. 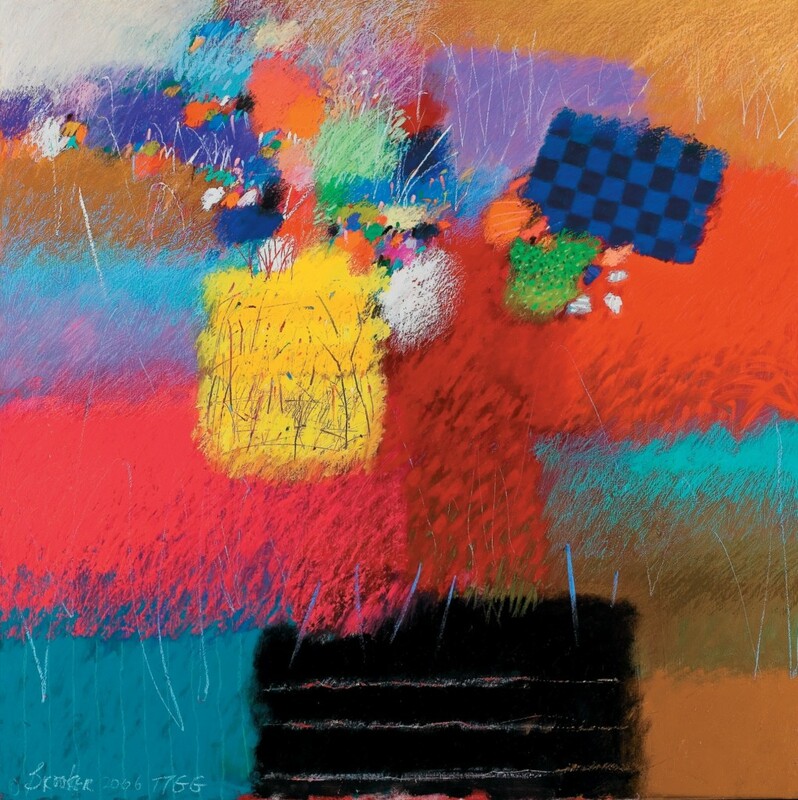 Therefore, when viewing Brooker’s paintings, one senses an ability to metaphorically dive into various layers of blocks and patterns of bright colors and shapes within a simultaneously vast and confined space, regardless of the size of the frame. In contrast, Christian ideals of faith are based on what a follower cannot see. In evoking the biblical scripture from Hebrews 11:1, Brooker remarks, “How can you be sure of anything if you don’t see it, if you don’t touch it, if you don’t have some sense of it. . . . It’s believing in something that you can’t see, but you know when you feel its presence.”26 In Korea, family members would tend to the box of the spirit within a shrine, traditionally at home for two years, such that their ancestor spirits would live together with them in this world. The high visibility of the deceased and their spirits through their beautifully adorned, often quite colorful shrines are far more physically grounded and metaphysically encountered. 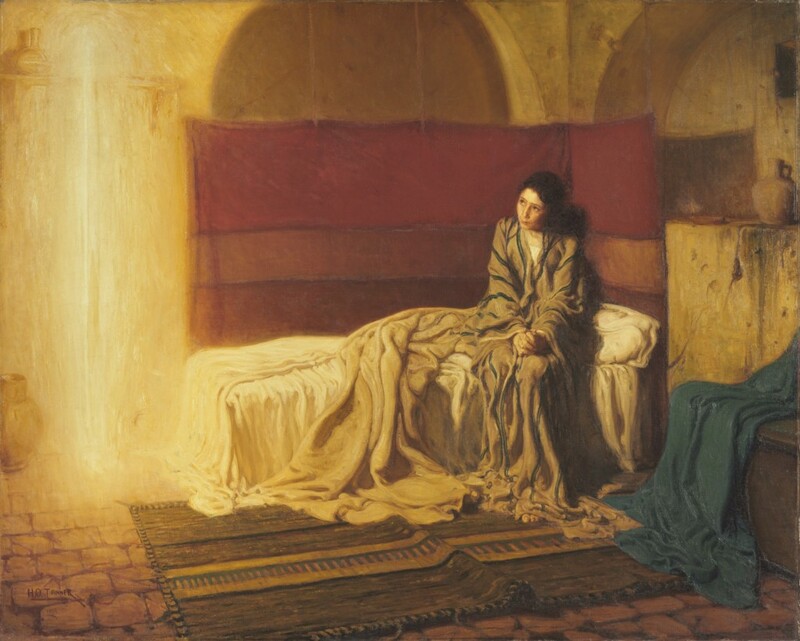 Brooker realized then that “God is a personal experience.” His witnessing of these cultural and spiritual differences, most palpably in how one honors the death—and presence—of one’s ancestors, one’s spirit in a triplicate universe, could provide universal access to a transcendent realm. For Brooker, improvisation on the canvas through abstraction provides access to a sacred realm through experimentation with structure, which enhances his spiritual engagement with God through painting. In jazz improvisation, one faces a number of challenges, such as learning how to start and stop solos, how to conceive and perform patterns in time, and how to gain mastery over the vocabulary and other materials required for any given piece of music. Brooker greatly admires the saxophonist Charlie Parker, namely because of his use of “substitute chords,” which he played and resolved in ways never heard before. Parker would choose musical steps based on what he was hearing and his accumulated musical knowledge, but he allowed for intuition to take over. 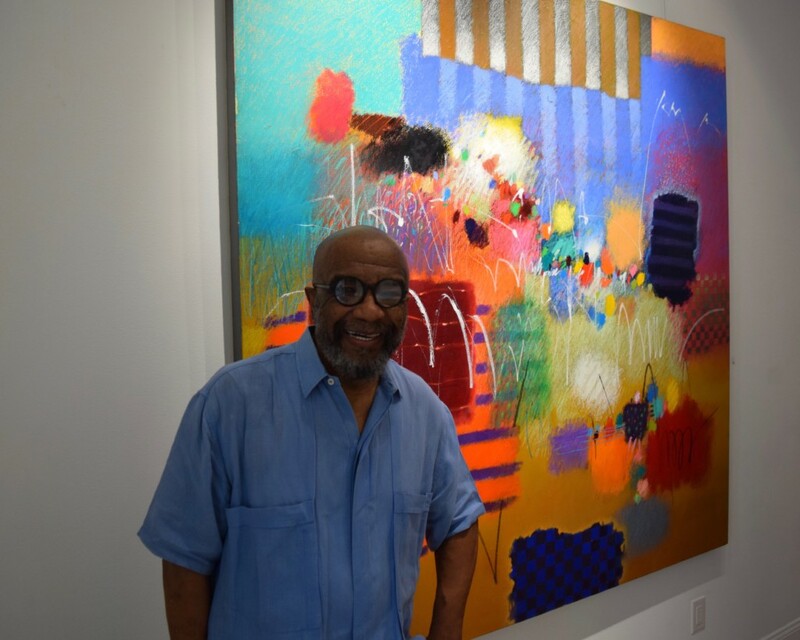 As a result, Parker, along with a myriad of jazz professionals performing at Minton’s Café in New York, created a new sound, a new style.32 Similarly, Brooker was able to discover his own visual language by applying parallel principles brought together harmoniously as a product of his everyday reverence for God, with paint as the medium, as material, and as intercessor. Visually, there is a nearly literal, formal, quilt-making stitching of the planes of color, line, and shape (as outlined by Kandinsky) that merges with the various musical influences (Charlie Parker) that Brooker’s study has brought together harmoniously as a product of his daily devotion (as articulated by Tanner). 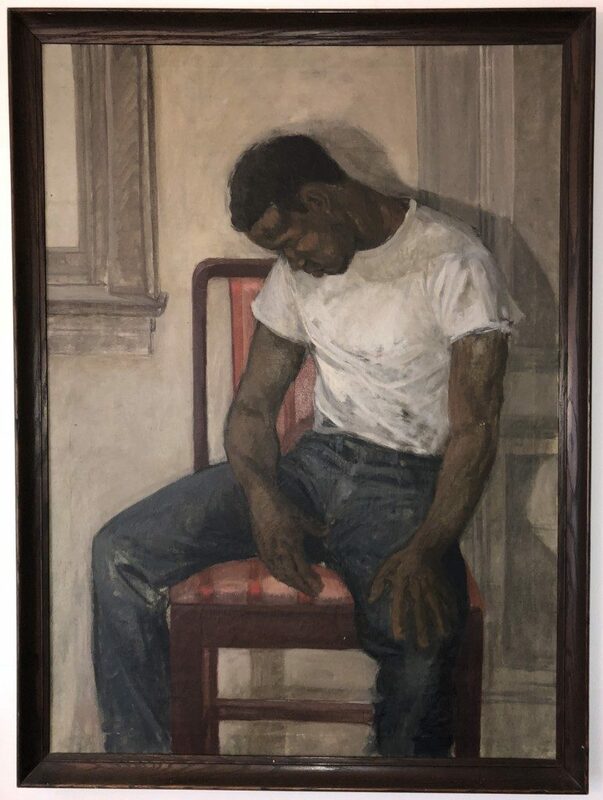 Cite this article: Nikki A. Greene, “Vibrations in the Soul: Moe Brooker’s Sacred Paintings,” Panorama: Journal of the Association of Historians of American Art 4, no. 1 (Spring 2018), https://doi.org/10.24926/24716839.1631. About the Author(s): Nikki A. Greene is Assistant Professor of Art at Wellesley College.